Airsource are pleased to announce the release of Cellar, developed together with Glasshouse Apps, on the Apple App Store! Cellar is not just a list, it's an actual Cellar! Using it is "almost as fun as drinking the wine you collect" - Michael Rose, tuaw.com. 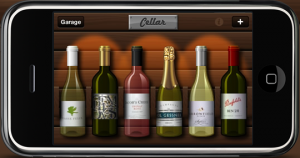 Cellar is a visual, editable, swipeable showcase. And when you have finished a bottle, if you would like to keep it for reference in the future, store it in the Garage where all your archived bottles are ordered by star rating, ready to be repurchased and moved back to the Cellar. Now available at a release sale price of 99 cents on the App Store.